Barbara's latest "Historically Speaking" article appeared in the Exeter News-Letter on August 20, 2010. When Ruth Stokell Challis wrote her essay, “I Grew Up in New Hampshire,” in 1944, she mentioned her father as a kind man who gave her a set of encyclopedias for her birthday. The large ever- expanding family lived on the outskirts of town on Epping Road near Old Town Farm Road. She recalled that “One of the earliest things I remember is the birth of one of my sisters.” It was the kind of memory that would be repeated often as her mother produced 11 children, eight of whom survived to adulthood. 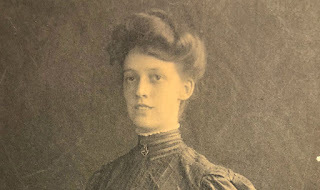 Ruth’s memories about growing up in Exeter in the late 1800s included stories of school and play and losing (and later finding) a little sister. She mentions her parents as a child might, with little specific detail. She left out the most obvious feature of her father – he had only one arm. One might think that a one-armed father would be an interesting part of one’s childhood, but to Ruth he was simply “Father” and the arm, or lack thereof, didn’t seem to matter much. George Lewis Stokell was born in Lowell, Massachusetts on April 1, 1846. His father, also named George Stokell, headed for California in search of gold in 1849 and told tales of the gold fields for the rest of his life. He didn’t strike it rich, however, and returned home to his family, moving them to Portsmouth, New Hampshire where he worked in the building and construction industry. Young George was quick to sign up when the Civil War broke out. He enlisted in 1861, at age 17, in his birth state of Massachusetts with the 18th Massachusetts Regiment and re-enlisted three years later. The War took him to most of the engagements of the Army of the Potomac, including the Second Battle of Bull Run, Chancellorsville and Gettysburg. While fighting in the Battle of the Wilderness in Spotsylvania, Virginia in May of 1864, his regiment lost track of him. He was listed as “missing in action” and was presumed dead. The Wilderness was the first battle that pitted General Ulysses S. Grant against General Robert E. Lee. Both sides saw heavy casualties. He was discharged in March of 1865 – just a month before the war ended. He returned to Boston to take up business, but later returned to New Hampshire where his parents were living. 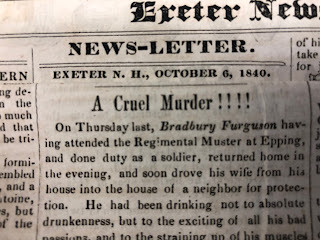 In 1882, already a widower with a young son, he bought a farm on Epping Road in Exeter and married Alberta Carroll – the twenty year- old daughter of Exeter’s Dr. Albert Carroll. Alberta was a graduate of the Robinson Female Seminary. The farm was able to support the growing family for many years. When the town of Exeter decided to close down the District Three School on Epping Road because of low attendance, Alberta simply set up her own school room and taught the children at home. The family moved to Gill Street to be closer to the public schools and the post office. Stokell served the town as postmaster for eight years, a well-deserved reward for his army service. When his final term was up, he moved to Medford, Massachusetts where he became commander of the Grand Army of the Republic post. In 1931, at the age of 87, the old soldier died. He’d been looking forward to marching in one last Memorial Day parade, but missed it by two weeks. The flags in Medford were put at half-staff in his honor.